The Illustrated Man - Jimmie Aaron Kepler, Ed.D. The Illustrated Man is a 1951 book of twenty one science fiction short stories by Ray Bradbury. Collectively, they explore the nature of humanity. While none of the stories has a plot or character connection with the next, a recurring theme is the conflict of the cold mechanics of technology and the psychology of people. The unrelated stories are tied together by the frame device of The Illustrated Man. He is a vagrant with a tattooed body whom the unnamed narrator meets. The man’s tattoos, allegedly created by a woman from the future, are animated and each tell a different tale. All but one of the stories had been previously published elsewhere, although Bradbury revised some of the texts for the book’s publication. The concept of the Illustrated Man would later be reused by Bradbury as an antagonistic character in Something Wicked This Way Comes, the tattoos coming to represent the souls of sinful victims of a mysterious carnival. I’ll give a plot summary, one short story at a time, of the eighteen science fiction short stories by Ray Bradbury that make up The Illustrated Man. Background: “The Veldt” is a short story written by Ray Bradbury that was published originally as “The World the Children Made” in the September 23, 1950 issue of The Saturday Evening Post, later republished in the anthology The Illustrated Man in 1951. The anthology is a collection of short stories that were mostly published individually in magazines beforehand. Summary: Far into the future, two parents use a high tech nursery to keep their children happy. The children use the nursery’s simulation equipment to recreate the predatorial environment of the African veldt. When the parents threaten to take the nursery away, the children lock their parents inside where it is implied that the parents are mauled and killed by the harmless machine-generated lions of the nursery. Detail: A family lives in a house with the latest technology. It is called the “Happylife Home” and its installation cost $30,000. The house is filled with machines that do everything for them from cooking meals, to clothing them, to rocking them to sleep. The two children, Peter and Wendy, become fascinated with the “nursery,” a virtual reality room that is able to connect with the children telepathically to reproduce any place they imagine. The parents, George and Lydia, soon realize that there is something wrong with their way of life. The emptiness of life in the “Happylife Home” has caused George to take up smoking and drinking, while the children have become stoners and juvenile. George and Lydia are also perplexed that the nursery is stuck on an African setting, with lions in the distance, eating the dead carcass of what they assume to be an animal. There they also find recreations of their personal belongings. Wondering why their children are so concerned with this scene of death, they decide to call a psychologist. Online Version: The short story “The Veldt” is found online at: http://www.veddma.com/veddma/Veldt.htm. A bitter astronaut feels he has accomplished nothing worthwhile in his life as he and the rest of his crew fall irrevocably to their demise in outer space because of a malfunction in their ship. The story illustrates the collapse of the sanity and logic of the crew members as they face their death. Ultimately, the lamenting narrator is incinerated in the atmosphere of the Earth and appears as a shooting star to a child after wishing that his life would at least be worth something for someone else. Mars has been colonized solely by black people. When they learn that a rocket is coming from Earth with white travelers, they institute a Jim Crow system of racial segregation in which white people are to be considered second-class citizens, in retaliation for the history of wrongs perpetrated on their race by white people. When the rocket lands, the traveler tells them that most of the Earth has been destroyed in a nuclear war, and asks for their help. The people realize that discrimination is harmful in all its forms, and reverse their planned segregation. A husband and wife living by a highway in rural Mexico go on living their normal, idyllic lives as the highway fills with people fleeing a nuclear war. The story ends with some young travelers they help telling them about the nuclear war, and how the world is ending. After the travelers leave, the residents briefly wonder what the world is, and then continue with their lives. This is one of my all-time favorite short stories. A group of astronauts are stranded on Venus, where it rains continually and heavily. The travelers make their way across the Venusian landscape to find a sun dome, a shelter with a large artificial light source. However, the first sun dome they find has been destroyed by the native Venusians. Searching for another sun dome, the characters, one by one, are driven to madness and suicide by the unrelenting rhythm of the rain. At the end of the story, only one sane astronaut remains and manages to find a functional sun dome. Astronauts of this story are few in number, so work as they desire for high pay. One such astronaut goes off into space for three months at a time, only returning to earth for three consecutive days to spend time with his wife and son. The story is told from the perspective of the son, who holds an interest in one day also becoming an astronaut. Talking with his father, the son learns of the constant battle he faces with yearning for the stars at home while yearning for home while in space. Despite this he has several times attempted to quit, staying at home with his family as he realizes his constant absence has nearly destroyed his wife. At the end of the story the father takes off into space one last time, only to meet his end by the sun, and thus causing his wife and son to live their lives at night to avoid that reminder. Sidebar: The story was the inspiration for the Elton John song, Rocket Man. The lyrics of the song were written by John’s longtime collaborator Bernie Taupin. They describe a Mars-bound astronaut’s mixed feelings at leaving his family in order to do his job. Musically, the song is a highly arranged pop ballad anchored by piano, with atmospheric texture added by synthesizer and processed slide guitar. In this story, a married couple awakens to the knowledge that the world is going to end that very evening. Nonetheless, they go through their normal routines of going to work, eating, brushing their teeth, and falling asleep, knowing and accepting the fact that they will not wake up. Two men in a spaceship are discussing how empty and cold space is. The first man is a little bit insane and keeps asking questions about how there is nothing sure in space and there is no night or morning. He refuses to believe anything about reality without sufficient evidence and soon becomes skeptical of everything he cannot directly experience. He said that he doesn’t believe in stars because they are too far away. The second man is wandering about the ship when he learns that someone has left the ship, and it is the first man. The first man is still talking to himself and has killed himself by letting himself fly freely through space. A couple from the future tires of the war in their modern lives, so they go on a vacation to the more serene past in an attempt to escape with the help of a company called Travel in Time, Inc. They go to Mexico in 1938, but are pursued by a government agent who forces them to come back to 2155. This story takes place on Mars, which is used as a quarantine for people with deadly illnesses. One day, the planet is visited by a young man of eighteen who has the ability to perform thought transference and telepathy. The exiles on the planet are thrilled with his ability and a violent fight breaks out over who will get to spend the most time with their visitor and enjoy the illusionary paradises he can transmit. In the struggle, the young man is killed and the escape he provided is lost forever. A reluctant Martian soldier is forced to join the army as they prepare to invade Earth. However, when they arrive, they are welcomed by a world at peace, full of people who are curious rather than aggressive. The protagonist meets a movie director, and it becomes clear that the people of Earth have planned to exploit the Martians for financial gain. He tries to escape back to Mars, but is run over by a car and killed. A rocket expedition from Earth lands on an uncharted planet to be greeted by a seemingly empty city. As the humans begin to explore, they realize that the city is not as empty as it seems. The city was waiting for the arrival of humans. It has the contingency plan of a long dead civilization. The place was put in place to take revenge upon humanity after humans long before recorded history wiped out their culture with biological weapons. Once the city captures and kills the human astronauts, the humans’ corpses are used as automations to finalize the city’s creators’ revenge; a biological attack on the Earth. Fiorello Bodoni, a poor junkyard owner, has managed to save $3,000 to fulfill his lifelong dream of sending one member of his family on a trip to outer space. The family, however, finds it impossible to choose who will go because those left behind will inevitably envy the chosen one for the rest of their lives. Bodoni instead uses the money to build a replica rocket from an old mock-up, and sets up a 3D theater inside the cabin and convinces the children they are actually going through space. The British edition, first published in 1952 by Hart-Davis omits The Rocket Man, The Fire Balloons, The Exiles and The Concrete Mixer, and adds Usher II from The Martian Chronicles and The Playground from The Stories of Ray Bradbury. 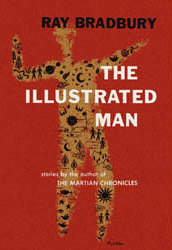 An edition published in 2001 by William Morrow omits The Fire Balloons and adds The Illustrated Man to the end of the book. Literary expert William Stendahl has retreated to Mars to escape the book-burning dictates of the Moral Climate Monitors. On Mars, he has built his image of the perfect haunted mansion, replicating the building from Edgar Allen Poe’s short story The Fall of the House of Usher, complete with mechanical creatures, creepy soundtracks and the extermination of all life in the surrounding area. When the Moral Climate Monitors come to visit, each of them is killed in a manner reminiscent of a different Poe story, culminating in the immurement of the lead inspector. When all of Stendahl’s persecutors are dead, the house sinks into the lake. When Charles Underhill was a boy, neighborhood bullies tormented him. When his son begins playing in a local playground, he becomes deeply disturbed when he sees a bully from his youth. I loved “Illustrated Man”. It was one of the books that made me fall in love with sci-fi. I wrote a story called “The Hallway” that a reader said reminded them of one of these stories. I only wish!